Laura Ingraham is one of those people who because she is photogenic is often touted as an “expert commentator” on various issues in public policy and science, despite only having a law degree. She’s had a somewhat unsavory career since her college days, where some of her accomplishments included “allegedly secretly taped meetings of a Dartmouth LGBT student group, later publishing the transcripts and the names of the officers in The Review.” However, despite a college career where she evinced the most strident anti-LGBT views imaginable, she later “came to Jesus” after her brother revealed he was gay. So she says. Here we see Laura Ingraham playing the role of medical commentator, in claiming that parents of transgender children who encourage treatment and help for their children as being guilty of child abuse, dropping vague warnings about puberty blockers and hormones which are sure to rile up the average American scientific ignoramus. You can read the article via the link below, and listen to a clip from her radio show. These things are expected to happen, of course, so long as the American public responds via false authority syndrome to a pretty face and body, ignoring all those “boring egghead” researchers who could never appear on the cover of Cosmopolitan. 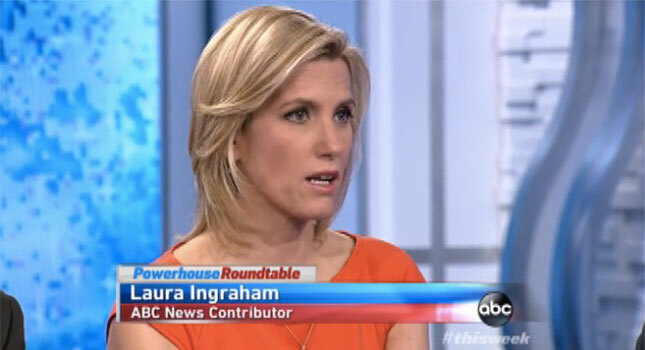 Medical Experts: Laura Ingraham’s Transgender Youth Advice Is “Dangerous,” “Child Abuse” | Blog | Media Matters for America. This entry was posted in Youth on August 15, 2014 by .